The plush exterior façade of Elba Palace Golf and Vital Hotel will thrill your senses. Located 3.3km from the scenic Las Corcobadas Beach in Caleta de Fuste, this upscale property strictly allows only adults. The grand chandelier and the traditional Canarian style architecture takes you by surprise as you enter the elegant property. 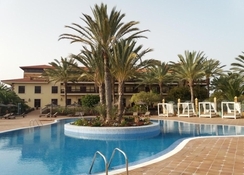 Set on a sprawling golf course with tranquil sea views, Elba Palace Golf & Vital Hotel is ideal for tourists seeking a venue to polish their golfing skills. 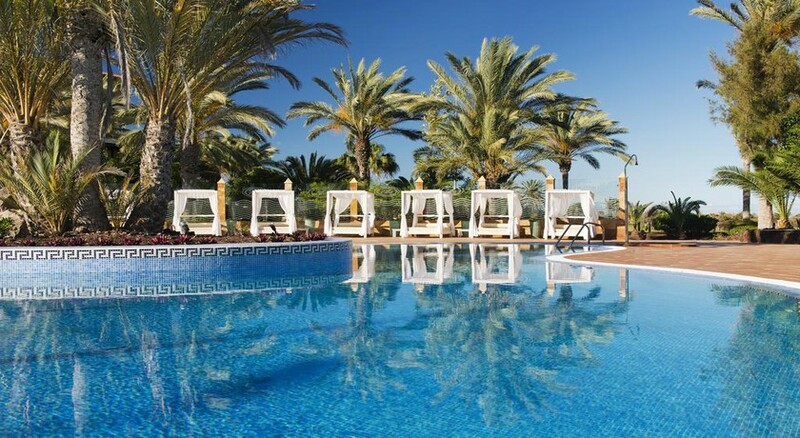 Soak in some sun at the inviting outdoor pool here. The golf course at Elba Palace Golf & Vital Hotel is equipped with 18 holes. In the evenings, do visit the beach at just 17 minutes’ walkable distance. Have some beach fun and take some lazy strolls at the beach. The Hotel is rather close to the beach and guests can take the free shuttle bus service to Caleta de Fuste available throughout the week. The scenic Cocobadas Beach is also nearby. Distance to Fuerteventura Airport is 10.4km and distance to Casa Museo Unamuno Fuerteventura is about 16km. Elegantly decorated rooms take you on a different level of luxury. The aesthetic appeal of the hotel is widened by its ornate wooden furnishings. Guests can enjoy free Wi-Fi facilities here. The rooms are equipped with flat-screen TVs. You can just relax in your rooms watching your favourite news channel or movie. Guests can avail room service at any hour of the day if you desire to eat in the privacy of your rooms. The rooms are equipped with minibars which you can use to satisfy your in-between hunger pangs. Make yourself a cup of coffee or tea whenever you want with the electric kettles available in every room. The upgraded rooms offer brilliant golf course views from the balconies. Suites here are a class apart and offer elegant living rooms too. If you are craving for some uninterrupted sound sleep, then do order a soft pillow from the pillow menu offered here. The bathrooms are quite luxurious offering bath tubs, hair-dryers, bathrobes and separate shower and bath areas. On the food front, the hotel provides a free breakfast served every morning. An informal Tapas Café is the place to be to enjoy some light bites and refreshments overlooking the golf course. 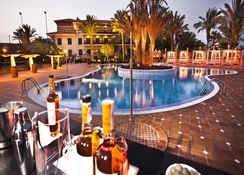 A posh restaurant here featuring a Canarian-style patio is the perfect venue to cater to your fine dining needs. One can groove in to the occasional live music played here. The restaurant has a plush wine cellar and a chic bar serving the choicest spirits in town. Guests can relish some heady drinks at the bar and also order some delectable cuisines from the a la carte restaurant here. For the diet conscious and vegan eaters, the hotel offers some vegetarian and low-cal options too. Well-maintained tennis courts also add to the charm of the property. You can find a sauna room here and a wellness spa wherein you can treat yourselves to some pampering massages and treatments. The beautiful central courtyard is a luxe place to relax. The golf course here holds a special thrill for the golf enthusiasts who revel in the luxury of the tree-lined golf course here with 18 holes. A truly delightful property, this one is on the list of the most popular properties in Caleta de Fuste.